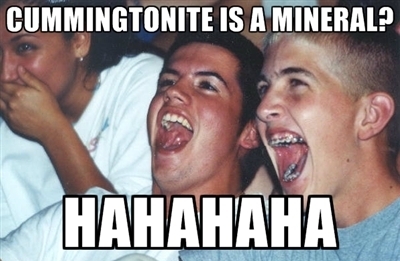 Cummingtonite; yes you read it right the first time and no doubt it raised an eyebrow and perhaps even a smile, but regardless of the innuendos, Cummingtonite is actually a mineral. Discovered in the town of Cummington, Massachusetts way back in 1824, which gave this fibrous mineral its distinctive name, the mineral has also been found in Scotland, New Zealand, South Africa, and Sweden. 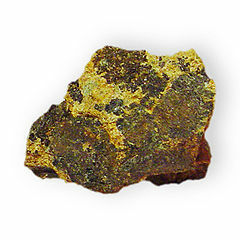 As a brittle and somewhat splintery type mineral with dark green, brown and grey undertones, it has translucent edges capable of transmitting light. Commonly occurring in metamorphosed magnesium-rich rocks, Cummingtonite can also be found in some volcanic rock collaborations, coexisting with other mineral groups and formations. Although this particular mineral is difficult to distinguish by eye alone, Cummingtonite is perhaps a great example of how the world of science can have a funny sense of humour!